Cyrus S. Eaton (1883-1979), born in Pugwash, Nova Scotia, lived most of his adult life in Northfield, Ohio on a cattle farm while working in downtown Cleveland. As a child, he worked in his father’s country store, the post office, and on their family farm. He studied to be a Baptist minister but turned his talents to business under the mentorship of John D. Rockefeller. Successful and controversial, Cyrus Eaton built companies in utilities, iron ore mining, railroads, steel manufacturing, and rubber. Beginning in the mid fifties, Cyrus with his second wife, Anne Kinder Eaton, turned his attention and passion to bringing together scientists to join together to strive for nuclear disarmament. 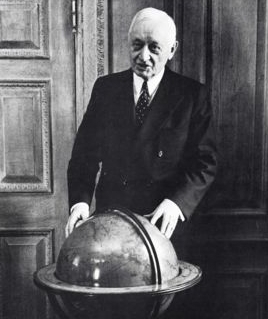 This movement called the Pugwash Conferences on Science and World Affairs was awarded jointly with Joseph Rotblat the Nobel Peace Prize in 1995. Cyrus and Anne traveled to Russia, Vietnam, Chile, Eastern Europe and Cuba to try and build relationships with these communist countries based on sharing ideas in farming, education, business, and the arts. Always, he encouraged conversations and helped to build trust. Board member, Lissy Gulick (daughter of Anne Eaton) remembers how Cyrus listened with full attention and empathy to young people because he wanted to know their thoughts and their passions. An avid reader, Cyrus read Shakespeare, history, philosophy, and poetry. He corresponded with diverse people around the world about peace, governing, business, farming, astronomy, and education. His passion for learning was immense. Cyrus Eaton founded the Cyrus Eaton Foundation in 1955. The SIX AREAS WE FUND all relate to significant interests of both Cyrus and Anne Eaton. Cyrus and Anne believed that helping people to become educated, employed, and healthy would inspire these same people to make a positive difference in the communities where they live and in the world community. Arts: Anne Eaton, a talented writer and compassionate woman, found joy in helping others participate in and enjoy music, dance, theatre, and visual arts. She recognized how important it was for individuals to expand their creative energies to live a fulfilled life. Conservation: Cyrus Eaton raised cattle and geese and helped begin the park system known as the Emerald Necklace. He donated land to be conserved for future generations. He planted trees and knew the enduring importance of being responsible stewards of the earth. Education: During his life, Cyrus Eaton built schools in Pugwash and Northfield and helped young people finance their educations. At Thinkers Lodge in Pugwash, Cyrus hosted conferences on education where he invited deans and presidents from US and Canada universities to share ideas about education. Health and Welfare: Spending time outdoors and always exercising, Cyrus Eaton valued health in himself and others. After the major fires in his hometown of Pugwash, he helped rebuild the village, provide schools that would improve employment opportunities, and contributed to agencies that provided mental and physical health care. Peace: Cyrus and Anne spent time and resources as they worked to build peaceful coexistence between disparate communist and capitalist countires and to help establish equal rights for African Americans and women. Cyrus was award the Lenin Peace Prize in 1960, and Cyrus and Anne Eaton were jointly awarded the Canadian World Federalist Peace Award in 1979. The Pugwash Conferences on Science and World Affairs, which Cyrus and Anne Eaton played a pivotal role in supporting, were awarded the Nobel Peace Prize jointly with Joseph Rotblat in 1995. In 1962 Cyrus Eaton was nominated for a Nobel Peace Prize. Public Affairs: Cyrus and Anne were both advocates of dialogue to expand civic responsibility, build leadership skills, and encourage clear communication skills. They were strong believers in truth, trust, and freedom of speech. Science: Cyrus corresponded with innovative thinkers in many fields of science, and he urged scientists to take responsibility for controlling the destructive powers science had unleashed. In addition, he made sure the schools he built had up-to-date science labs which encouraged students to pursue advanced degrees in science, nursing, and medicine.